Wow! It's already time for another installment of Kickass Manicures! Can you believe it? Like always, the nail blogosphere was chock full of amazing nail arts, so it was difficult to choose! Don't forget to follow the links back to their originating posts, and let these ladies know how talented they are! Can you believe this is Copycat Claws' first time painting freehand roses?! I think they look amazing, and the color choices are spot on! And, of course, I love the base color: Emily de Molly- Tread Lightly! This is just such a pretty look! Um. This is so graphic and AMAZING! I love how the smaller gradient diagonals are echoed by the larger ones on the middle and ring nails! The color palette of soft blues and white is so pleasing too. This is just perfection! Lindsey does incredible hand painted manicures, and is an expert at pairing colors and hand-painted shapes. These nails were inspired by a print fabric, but I have to say that I like her version better! So pretty! I love how each nail is different, but the entire manicure is cohesive! Look at this gorgeous watermarble! I love grey polish, and this just steps it up a notch with the silver accented French tips and triangular studs! I don't think I've ever seen a watermarble with French tips before, actually. These are kickass nails! I fell in love with these nails as soon as I saw them! It's great how neutral but interesting they are, and the little shiny, metallic hints are perfect. The cabochon from Born Pretty Store is a great accent too! 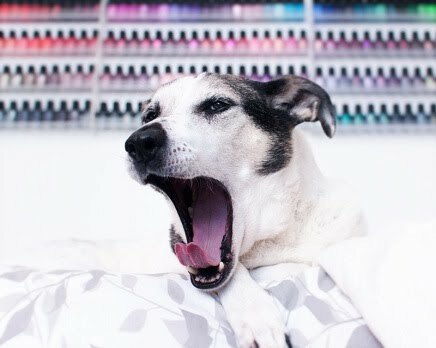 Did you see any other noteworthy nail art this month? These are like mini works of art!! So lovely! I feel like I'm lucky just to paint one color decently, much less attempting nail art yet...but I'm always inspired by your posts!!! Thanks for sharing! Mail-time: Cirque Colors Vice Collection! Mail-time: ILNP Summer 2015 & New Ultra Holos!